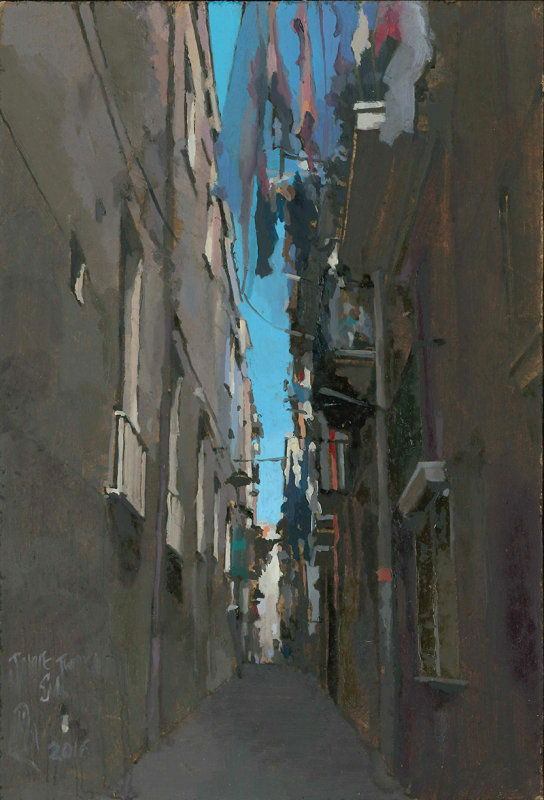 A painting depicting one of the many nefarious, towering, claustrophobic alley ways which criss cross the San Lorenzo district of Naples. The very earth beneath your feet is riddled with ancient tunnels from the industrial scale Roman Tufo mines and archaeological ruins stretching back to the cities Greek colonial beginnings. This district is the heart of the oldest continually inhabited city in Europe. This Neapolis must lie undisturbed deep beneath the most densely populated district of the city and indeed of all Italy. The crumbling apartment blocks seem to have been flung down in state of glorious disorder, anathema to city planners and joy for anyone whose heart thrills for sudden perspectives of a greater past.